Today I will be going history adventuring IRL (In Real Life) in Phoenix. Of course, I'm history adventuring all of the time in cyberspace, looking at old photos of Phoenix, maps, that sort of thing, but every once in a while I get out there in the real world. If you'd like to do this, I encourage you. It's great fun, and it's an inexpensive form of entertainment. Of course most people will have no idea what you're doing, so it's not a bad idea to tell your friends that you're going to a restaurant with friends. Most people do that as the main focus of going anywhere except work and errands, and so it makes sense. Saying something like "I'm going to see the KPHO radio building on Buckeye Road and 23rd Avenue" will probably get blank stares from people. But then if you say, "And then I'll be going to Blah Blah Blah Restaurant", they will relax, and be fine with it. But I know that you understand, so I'll tell you what the plan is today. I will be going to see the building there at the top of this post (the photo is from the 1940s). 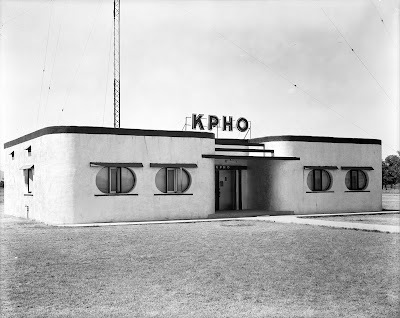 It was the original building for KPHO radio. I'll probably take a photo of it and do a "then and now" photo. But mostly I want to see it, and to feel what I would have been like to be there in the 1940s. There's nothing else I want to do. I have no other agenda other than going there. I take only photographs and leave only footprints. If you're a wilderness hiker, you know what I mean. Of course, being there on the westside, there's so much else to see. A couple of weeks ago, as I was waiting to be dismissed for jury duty in downtown Phoenix in the Superior Court Building, I spent a lot of time looking out of the window (we waiting in the hallway for hours). And since the view was looking west, I could see the silos of Feeders Grain, which is along the railroad tracks just west of I-17. And I want to see that today also. And when I see it, I time-travel to a time when you could have seen it for miles and miles. Nowadays, of course, you gotta go look for it. And I have a LOT of fun doing that! When I'm history adventuring, I know that I have to stop and eat, but I try to keep the time spent to a minimum. I pack a lunch, do a quick "pit stop", and then back to adventuring. There's so much to see! Thank you for history adventuring with me! Image at the top of this post: The KPHO radio building in the 1940s, 2333 W. Buckeye Road, Phoenix, Arizona. As of this writing, it's still there.